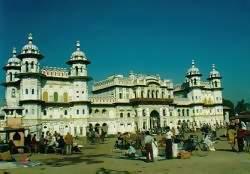 Ram Janaki Temple is part of the Tentative list of Nepal in order to qualify for inclusion in the World Heritage List. In 2001 I toured around Nepal for a month by public transport. To avoid a 12 hour bus trip I flew from Kathmandu to the southern city of Janakpur. I'll never forget the moment I stepped off that (little) plane: hundreds of poor looking relatives and rickshaw cyclists were eagerly waiting behind a fence, looking at the handful people that were on the plane. A bit like arriving in Calcutta. One of the rickshaw men was able to make eye contact with me, and signed where I had to go to leave the airport and arrive at his rickshaw. He transported me safely to the 'best' hotel in town, where I was the attraction of the day. The next day I visited the Janaki Mandir: the city's largest Hindu Temple. It's a dazzling sight, a fairy tale like palace in the middle of a dusty and poor town. The size of the building is huge, and the little turrets can be seen from afar. In front of the temple is a large square where locals hang out and meet. I can't remember having been inside the complex, it might be that entrance was/is forbidden to non-Hindus.